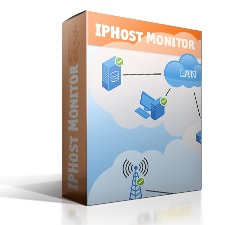 IPHost Network Monitor can be used to monitor servers, applications, network resources, and so on in multiple separate networks. 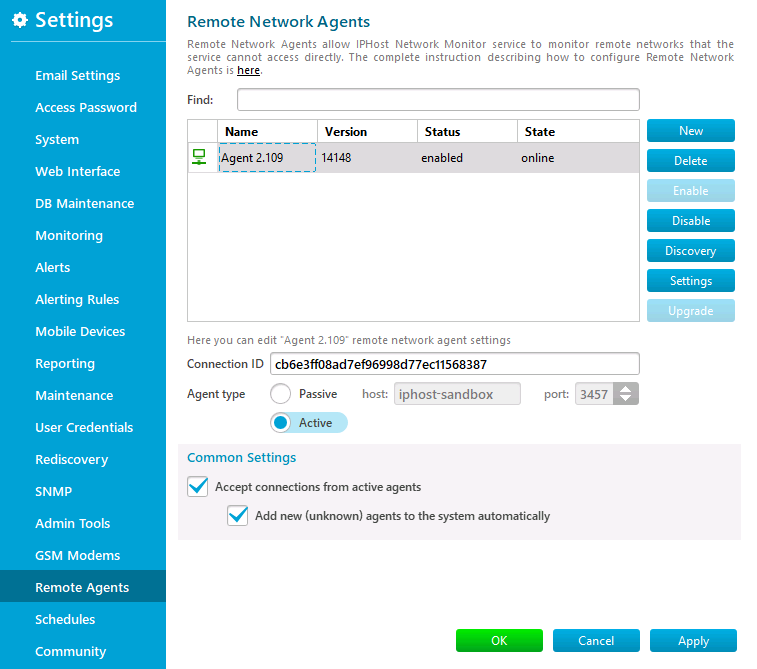 To enable monitoring in another network you should install Remote Network Agent on a Windows-powered computer in this network. To install Remote Network Agent, download its installation file from the product site, start it on the machine you want to install Remote Network Agent on, and follow the installation wizard instructions. When installation is over, the Remote Network Agent GUI will start and you should select agent mode – active or passive, then specify the domain name or IP address of the computer where IPHost Network Monitor is installed, and the port number the agent will use to communicate with IPHost Network Monitor (the default port number is 3459 and usually you don’t need to change it, but if you do it is necessary to set the same port for IPHost Network Monitor). You should choose agent mode (active or passive) in accordance with your network security policy. 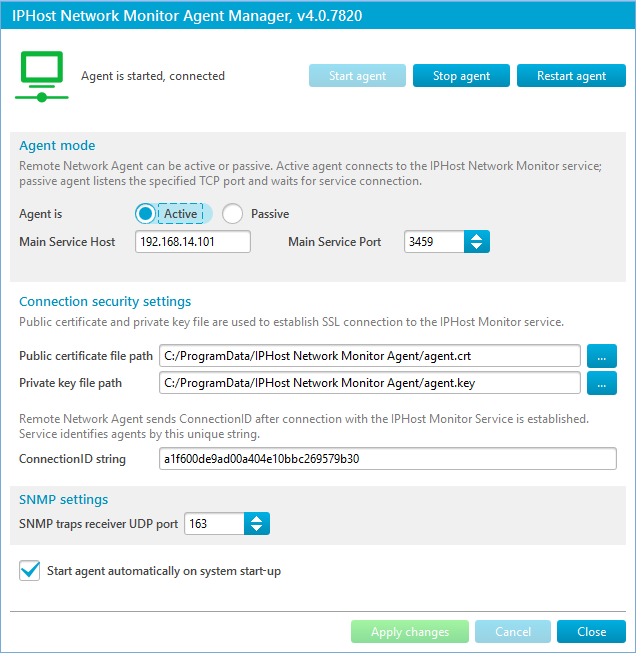 To enable active agents you should open the specified port for incoming connections on the computer with IPHost Network Monitor installed, and for outgoing connections on the computer with active Remote Network Agent installed. For passive agents the specified port should be opened for incoming connections on the computer with passive Remote Network Agent installed, and for outgoing connections on the computer with IPHost Network Monitor installed. After agent setup and Agent restart, it will try to connect to the IPHost Network Monitor monitoring service. The agent status is shown at the left-hand top corner of the Remote Network Agent GUI window. There are three buttons for agent control: Start agent, Stop agent, and Restart agent at the right-hand top corner of the window. Note: Advanced security settings are available. A self signed certificate and secret key are created during Remote Network Agent installation, they are used to establish SSL protected connection with the IPHost Network Monitor main service. You can specify your own custom certificate and key instead. The certificate fingerprint is used as the agent’s Connection ID. The main monitoring service identifies agents by the Connection ID, so if the key pair is the same you can easily move an agent from one host to another without reconfiguring the agent’s monitors and hosts. In section [SSLSettings] set the variable Service CertificatePath to the full path of the monitoring service’s certificate file, e.g. and restart the agent service. Remote Network Agent runs as a service and starts on system startup by default, if it is necessary you can set it not to start on system startup. When active Remote Network Agent is configured it starts trying to connect to the IPHost Network Monitor monitoring service. When the agent has connected, IPHost Network Monitor shows a dialog that contains information about the new agent and suggests to open the agent’s settings. To enable monitoring via the agent you should click the ‘Enable’ button. Now this agent is ready to start monitoring remote network resources. To open the agent management panel select ‘Settings’ from the ‘Tools’ menu (or click the ‘Settings’ button on the toolbar) then select ‘Remote Network Agents’. Here you can create a new agent, delete an agent, enable or disable monitoring via an agent, change the network discovery settings for an agent and start discovery, and remotely upgrade an agent to the new version. 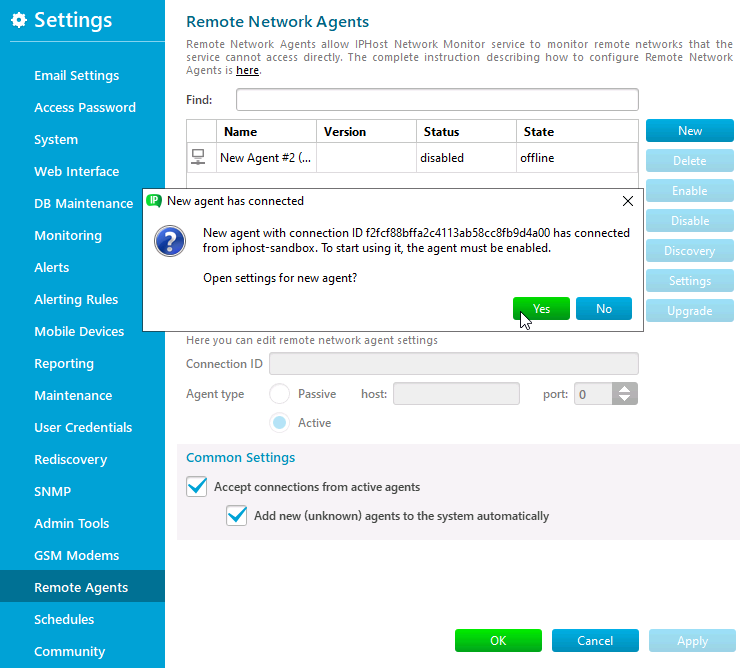 For passive agents the installation procedure is slightly different: you should first install an agent on a remote computer without starting it, then create and configure a new passive agent entry on the main service computer using the agent management panel, and after that you can start a passive agent on the remote computer. Once configured, active and passive agents are used in the same way. You can configure system limits on remote agent. To do this select agent and click Settings button. You can read more about system limits on Monitoring page. Once Remote Network Agent is created and enabled you can start using it for monitoring. IPHost Network Monitor automatically creates an agent entry named ‘Monitored by ‘Agent name (Agent IP)’ agent’ in the ‘Main view’ tree view. It groups all hosts and monitors monitored by a given Agent. an agent from the list on the agent management panel and click ‘Discovery’). An easy to follow wizard can help create a new monitor for both methods listed above. Note: the IPHost Network Monitor monitoring service (main installation) is reffered to as ‘Local Agent’.